IAREEE founders members been actively involved in the solar energy industry since 2008, IAREEE started operation in 2014 and has delivered a vast range of highly valuable intelligence and consulting products and services to solar industry delegates and the broader business community. IAREEE solar consultants and engineers provide expertise and advice to support solar projects worldwide. In recent months our technical founder committee has advised on developments in the Egypt, Malaysia, Sudan, UAE, Qatar and Saudi Arabia for clients including developers, owners, EPC Contractor, private investors and financial institutions. The IAREEE technical founder committee has advised on over 1.5GW of solar PV projects on PV plants globally and offers assessment of large-scale solar energy projects, at any stage of development. Usually, the person without professional or specialized knowledge can hardly identify the quality of the photovoltaic solar system that he want to install. Here, the photovoltaic system pass help: providing transparency and security. Photovoltaic plants systems are high-quality products with a long service life of over 30 years - if good components have been used and planning and installation have been carried out according to the rules of technology. However, it is usually difficult for the person without professional or specialized knowledge to identify the quality of the plant. Therefore,The photovoltaic system report PV-PASS are helpful. It is a multi-page form that indicates which information and documents are available when a photovoltaic system is handed over, and which guidelines should be observed in the planning and installation of the system. It also contains the template for a log of the acceptance measurement. 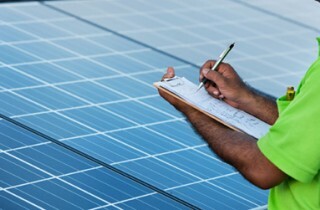 Installer fills the PV-PASS report by checking the points listed, filling in the minutes and enclosing the documents mentioned, to prove that the system works properly when transferring. IAREEE consultant attend the final handover to identify the quality of installation with independent testing. With the respective pass, installers thus easily verifiably understands person without professional or specialized knowledge that he has worked according to the rules of technology and thus gives a high quality overall product. The photovoltaic system Report PV-PASS create transparency and therefore safety for the customer and installer and allow the tradesman to demonstrate that he has worked in a professional manner.